Most people will say they are fairly aware. They see themselves focused on the work they do each day, achieving goals, and building quality relationships. 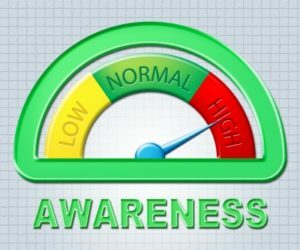 The fact of the matter we all suffer from lack awareness to some degree, and what determines ongoing improvements in performance, is being aware of our blind spots. It’s important to understand, our modern day world is full of distractions that leave us vulnerable to low self-awareness. So how do we improve our self-awareness and consequently, our performance? By developing habits that tune us in to our own behaviours. Technology has been increasing the speed of life and business for well over a decade. Whether it’s through multi-tasking or being completely distracted from what is important at any given moment. The result—we move way too fast at times, thus, missing out on great opportunities. High-level performers are masters at removing the unimportant distractions from their psyche and completely focusing on the task at hand. For those of you who have taken my workshops, you already know the ability to having a laser focus is something anyone can learn. And once learned and practiced, you will develop stronger “focusing muscles”, which will greatly improve your self-awareness. In our individualistic culture, we often get caught up in our own thoughts and headspace. Great performers know the importance of having a trusted advisor, be it a mentor or a coach. This is a person who will point out our accomplishments (yes, we have plenty of those) and our blind spots. Good or bad, great performers love to learn from feedback, and they know their trusted advisor will help them develop better self-awareness strategies, even when it makes them feel uncomfortable at times. As I have mentioned previously, great performers have a strong circle of 5 people they associate with. These associations help them develop a deeper sense of self and professional awareness. The power of the circle of 5 can never be underestimated, especially when it comes to developing and improving awareness skills. So ask yourself, who is in your circle of five? How self-aware are they? Slow it down, find a trusted advisor and associate with self-aware people in order to continue improving your self-awareness.